On Tuesday afternoon, President Trump announced the United States’ withdrawal from the Iran Nuclear Deal. The Iran Nuclear Deal was the result of two and a half years of negotiations, and it consisted of Iran’s agreement to end its nuclear program in exchange for the U.S. and several allies lifting decades of economic sanctions. 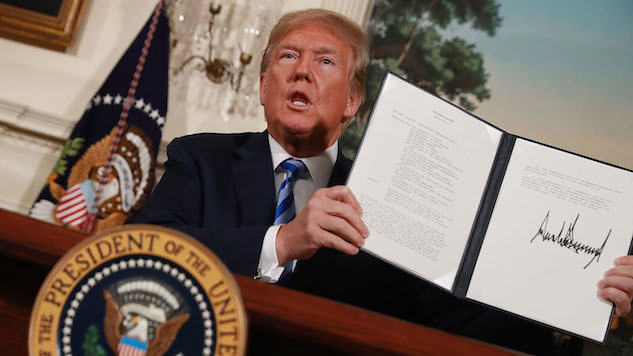 Trump has repeatedly suggested that Iran has been allowed to escalate their nuclear weapons program after the deal was made in 2015, despite the fact that international inspectors have found not any violations of the terms by Iran. Trump’s decision means Iran’s government must now decide whether to follow the U.S. and withdraw. Iranian President Hassan Rouhani warned there was only a short time to renegotiate with other countries and Iran could soon “start enriching uranium more than before.” Hours before the announcement, European countries met to reaffirm their support for the agreement. France, Britain and Germany all said that they regretted Trump’s decision.